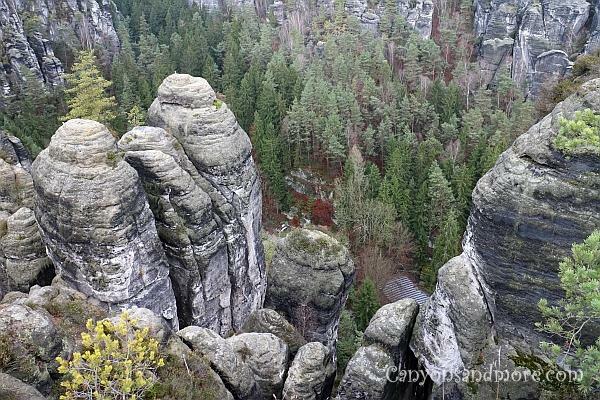 The Elbe Sandstone Mountains is a a mountain raunge and is a national park located on the border of Germany and the Czech Republic. If you happen to be visiting the lovely city of Dresden, it is well worth taking the time to drive the extra 40+ kilometers to see this fascinating and natural attraction. There are parking areas close to the main attractions like the “Basteibrücke” from where you will only need to walk an additional 10-15 minutes. There is also a hotel and restaurant at the location for those wishing to take a few days to enjoy the area. 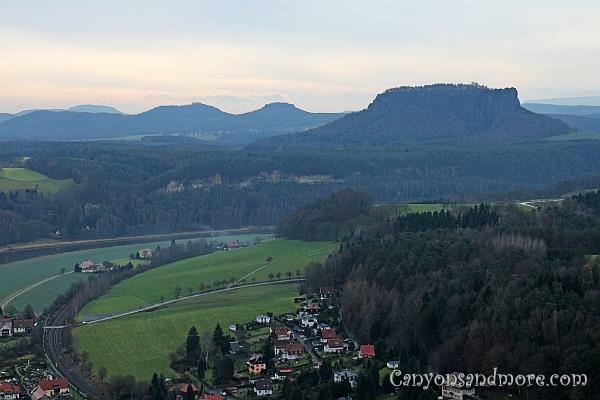 The view over the valley below of the Elbe River and the small villages along the river is breathtaking. The panaroma of mesas in the distance make this a very beautiful place to see any time of the year. These images were made in December, so vegetation is at a minimal but you are able to see more of the sandstone peaks due to the lack of leaves. 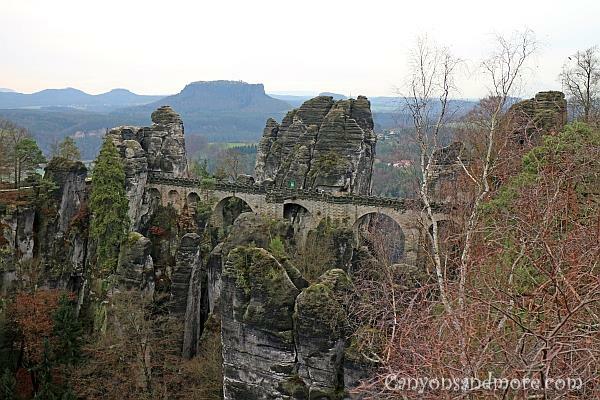 The image above shows the famous “Basteibrücke” or the Bastei Bridge. It is a highlight of this area and is probably the most photographed attraction of this national park. 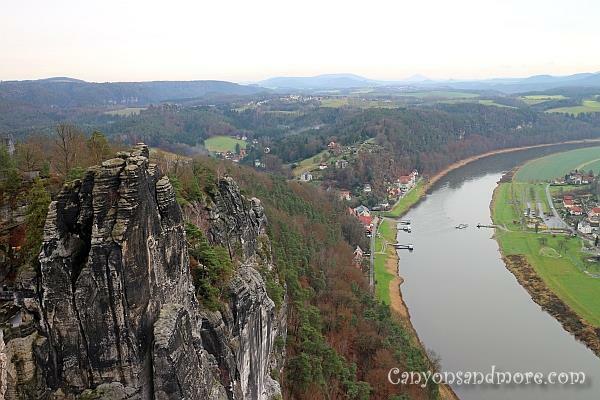 A magnificient landscape over the Elbe River can be seen from various platforms at the mountains. Signs lead you to the variety of highlights of the area. The “Basteibrücke” is the famous bridge. 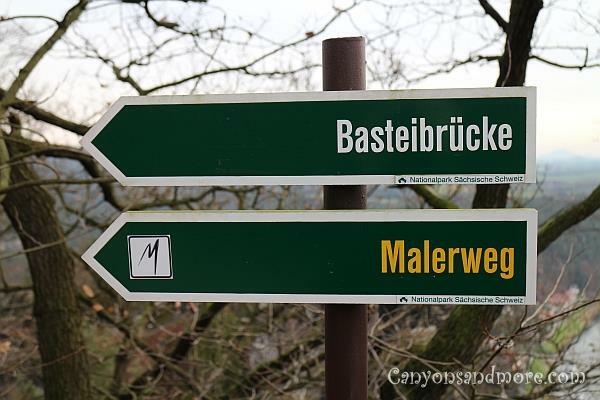 For those who wish to feel inspired from the landscape for future paintings, they can follow the “Malerweg” or the “Painter’s Trail” to see impressive scenery. 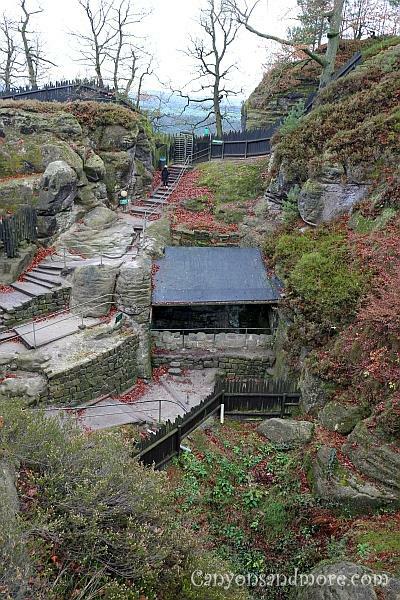 This is an awe-inspiring glimpse looking down into the cliffs. 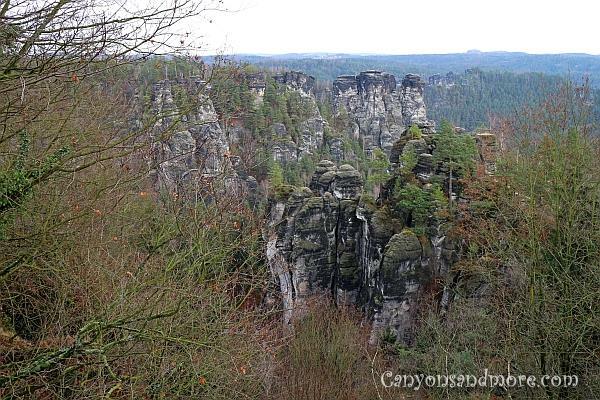 There are many platforms where you can stand and see spectacular views of the peaks. This is a village settlement “Felsenburg Neurathen” located at the top of one of the mountains. It existed between the early 12th century until the year 1469. You can tour the area and signs inform you about how the people lived and survived here. Here you can see the “Zisterne” which is a Roman invention to collect water for the residents of the area. 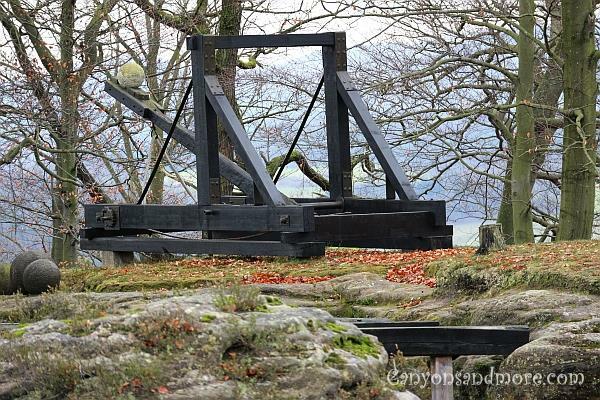 This is an example of a catapult used by the settlers that lived on the mountain. There are also stone balls seen here and these can weigh up to 50 kilograms each. 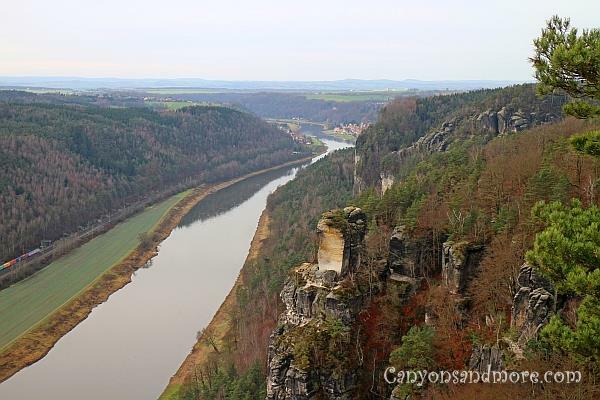 The Bastei Cliffs near Rathen are stunning to see. There are over 1000 peaks to climb for those who enjoy the sport. The view of the Elbe looking towards the direction of Dresden. The water is calm at the moment but the Elbe often causes a lot of flooding in the area. 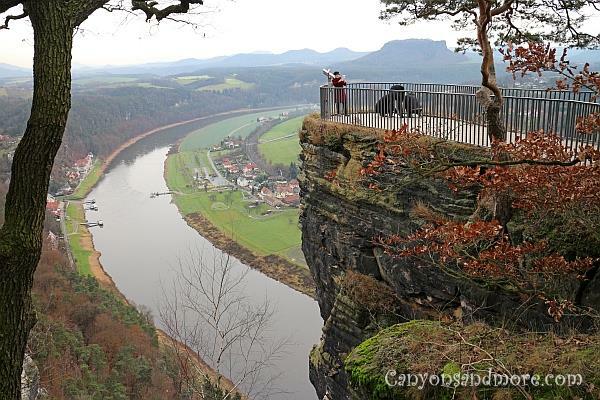 A look over the Elbe River and the town of Rathen below. A ferry boat brings the people from one side of the river to the other. The landscape in the distance is covered with several small mesas.